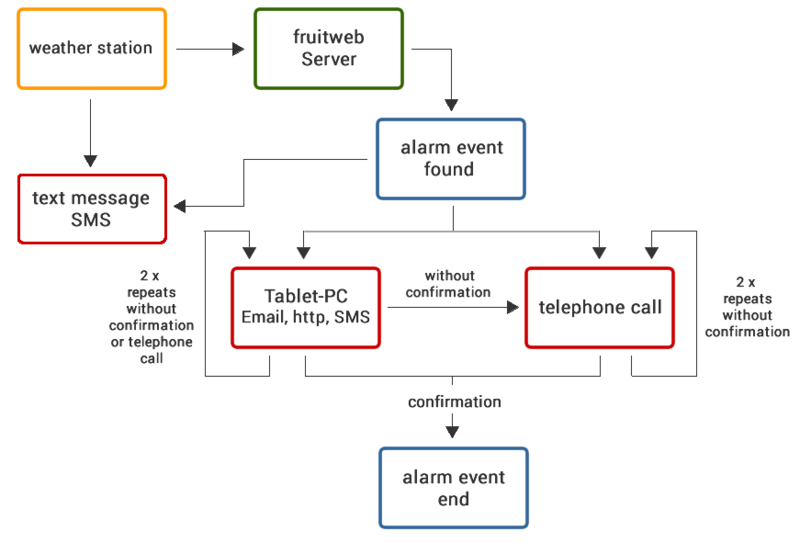 The fruitweb Frostwecker is a web based fros twarning system. Waether stations at the orchards measures in short intervals the wet-bulb and dry-bulb temperature and the relative humidity. The collected data are transmitted to the fruitweb server. The transmission interval depends on the type of station, but is no longer than 15 min. At the fruitweb server the collected weather data and a lokal weather forecast are used to generate a modern frost warning. The special item of the Frostwecker is the differentiated temperature prediction. It is based on the local weather forecast with a resolution of 3 x 3 km. The wet-bulb temperature is then calculated on the basis of the air temperature and relative humidity. A service that is so far unique in this form. Two hours after sunset, we predict the minimum temperature in a typical radiation night (windless and cloudless sky). This forecast is updated several times at night. Please click on the image to increase! Additionally it is possible to calibrate the weather forecast with local weather data (MOS), wich improves the quality of the weather forecast. Each participant in the frost alarm can select up to three weather stations of the pool and set a personal alarm threshold for the wet-bulb temperature, dry-bulb temperature and the dew point. The warning threshold can be continuously adapted. The ongoing monitoring of temperatures and forecasts is displayed ? ?in tables and graphs, which has been specially optimized for viewing with a tablet PC.